Direct Presidential Election Still Has a Long Way to Go전남대학교 총장직선제 실현 가능한가? Is it possible that the 20th president of Chonnam National University (CNU) will be elected directly by its members this year? The current president was selected through a direct vote by CNUians four years ago. However, CNU revised its regulations from a direct election system to the current indirect election system by the order of the Ministry of Education in 2012. 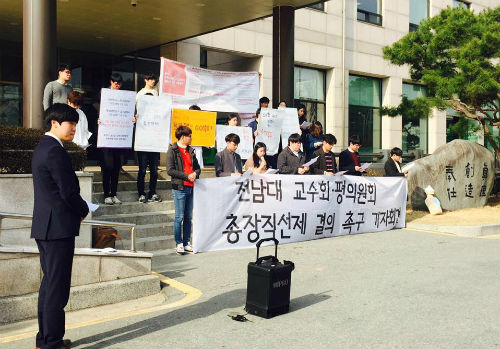 Last year, a professor at Pusan National University committed suicide for university democracy after protesting against the university’s decision on the presidential election. This incident has sparked the demand of direct presidential election at universities. 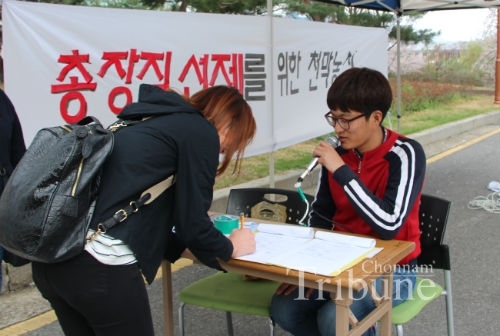 In this article, the Chonnam Tribune looked into the issues about the next presidential election. ▲ CNU Faculty Council member's votes are counting on April 7, 2016. If the university confirms the revision of the regulations for the direct election system, the 20th President Recommendation Commission will be organized and presidential candidates will be selected by the direct vote of CNU members during two weeks. Every professor and the representatives of administrative staffs, assistants and students will receive the right to vote at the rate of 86%, 12%, 2% and 2% respectively. Presidential candidates will be selected by a policy appraisal group and investigation of research ethnic group according to indirect election regulations. Each group’s members will be chosen randomly for fairness. 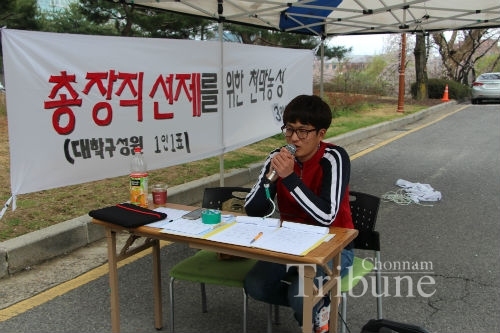 Except Pusan National University, national universities adopted the indirect election system. The point that we should notice is most of the national universities had tried to implement the direct election system but eventually they changed over to the indirect election system. There are many reasons on their decision. The major reason is the executive and financial restrictions from the Ministry of Education. If the schools enforce to keep the direct election system, they would cut financial support. Furthermore, even though some universities recommended presidential candidates selected by indirect election, the Ministry of Education would not appoint their president. Then, is this a problem only for universities in Korea? American universities used to select their presidents through an organization called President Search Committee. But now they usually select the presidents by the committee that includes students, professors, the board of directors and alumni who have applied through open recruitment and advertisement. The composition of the committees is run flexibly according to the characteristics of each university. In the case of Japanese universities, the committee or board of directors do not have the right to choose their dean or president. Each university autonomously makes a selecting system of the university president and enforces it. It shows that the governments guarantee the autonomy of universities and respect the opinions of students, professors and even local residents. ▲ GSC members hold a banner during a news conference to demand the direct presidential election outside the Adminstration Headquarter building on March 17, 2016. What an irony that the government invades and thwarts the autonomy of universities in a democratic country? It is absurd and ridiculous that the Ministry of Education is concerned about each university’s president and takes part in choosing them. However, the current situations do not seem to be improving. There are some educational projects such as ACE, PoINT, CK, CORE, and PRIME related to the university president election system. If we do not enforce the indirect election system, we would receive a low evaluation and the financial support will cut down. In other words, the Ministry does not respect university’s autonomy in the methods of choosing a university president. ▲ A GSC member is promoting the signature campaign for the direc presidential election in front of the Administration Headquarter building on April 2. Each university could decide autonomously how to select its president by law. There are still difficult parts including the revision of the related regulations. Thus, all CNU members have to pay attention to this matter. The president of the universities should be elected by the direct votes of professors, administrative staff, and students.